Come out & join us for a Spooky good time! Kids 13 & I under can come celebrate Halloween a little early with us by particIpating in a Trunk or Treat! Event is Free! 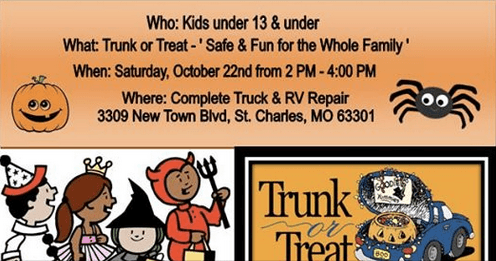 If you like to participate with your vehicle RSVP deadline is October 19th Please RSVP by calling Kim at (636) 724-2232 Vehicle must arrive 30 minutes prior to start of the event decorated & with candy to hand out. We have added a kind donation to support St. Louis County Police Officer Blake Snyder, 33, was killed in the line of duty on Thursday, Oct. 6, 2016.